Twenty thousand years ago, when giant sloths and saber-toothed tigers roamed the Los Angeles Basin, in the dark ocean depths lived an immense colony of worms. Not your garden-variety earthworms, but furtive creatures that lived in little shell-like tubes hundreds of meters below the sea surface. Life must have been good because the worms grew and reproduced until they covered an area the size of a large city block. Within a few thousand years, however, all the worms died off, leaving behind a huge mound of worm tubes and carbonate rock that currently rises five to 15 meters (16 to 50 feet) above the surrounding muddy seafloor. 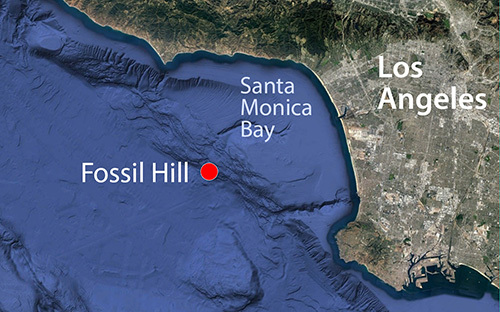 Scientists at MBARI discovered this lost “city of worms” while investigating several strange mounds that rise above the seafloor in the deep waters off Santa Monica Bay. Magdalena Georgieva, a postdoctoral researcher with the Natural History Museum of London, worked with MBARI researchers to produce a scientific report about this worm colony, which was recently published in the journal Frontiers in Marine Science. MBARI researchers had been mapping this area since 2010 using high-resolution sonar on MBARI’s autonomous underwater vehicles. Their goal was to locate the traces of underwater faults and nearby “cold seeps” where gases and fluids seep out of the seafloor. 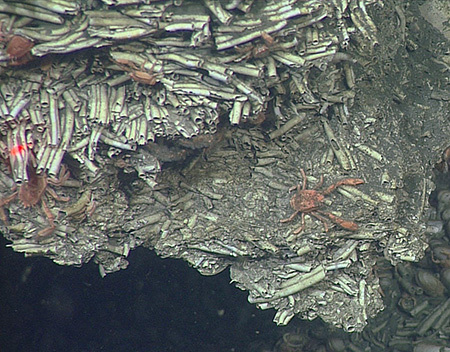 Marine cold seeps are fascinating environments where the geology of the seafloor affects water chemistry which, in turn, affects local communities of animals and microbes. 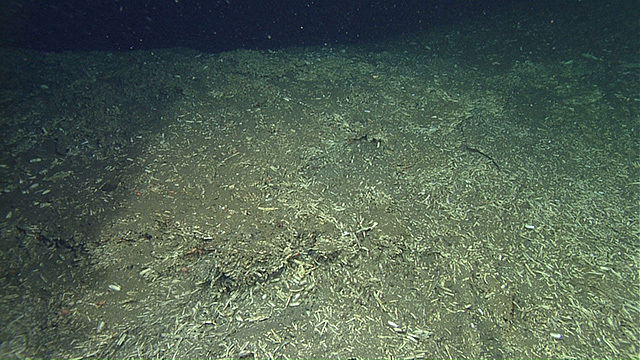 Seeps show up in sonar because chemicals from the seeps interact with seawater to form hard calcium carbonate rocks that stick up above the surrounding muddy seafloor. Seeps also support chemosynthetic clams, mussels, and worms that partner with specialized bacteria to feed on methane, sulfides, and hydrogen in the seep fluids. The researchers were fascinated, but also perplexed at what they saw on Fossil Hill. Although Fossil Hill contained millions of fossilized worms, they were not the type of tubeworms usually found at cold seeps. Instead they were in a family of worms called the serpulids. Serpulid worms live on the seafloor from tide pools down the deepest parts of the ocean, and are sometimes found at cold seeps, but they are not known to be chemosynthetic. In any case, Fossil Hill was by far the largest colony of serpulid worms the MBARI researchers had ever seen. Even more perplexing was the fact that, although Fossil Hill contained millions of dead, fossilized serpulid worms, there were no living serpulids on the mound or anywhere nearby. 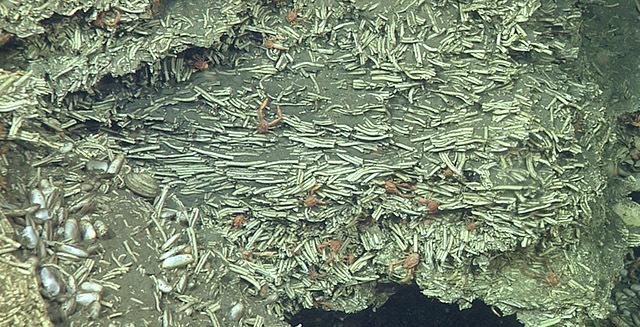 Within Fossil Hill, layers of fossilized serpulid worms alternated with layers of fossilized chemosynthetic clams, and the mound still hosts an immense population of living chemosynthetic clams and extensive bacterial mats. So Fossil Hill was and continues to be an active cold seep. But scientists have never found living serpulid worms that can use chemicals as a source of food. Were these worms an exception? The authors of the recent article can’t answer that question just based on fossils, but they do suggest that the worms are a species that is new to science. Another, perhaps related, mystery is why all the serpulids at Fossil Hill died out soon after the end of the last ice age. Using carbon-14 dating, the researchers estimated that most the fossil worm tubes formed between 23,000 and 25,000 years ago—the peak of the last ice age. At this point, sea level was about 100 meters lower than today and the coastline would have been out at the edge of what is now the continental shelf, roughly 20 kilometers (12 miles) seaward of where it is today. Just offshore of this ancient coastline, the ocean would have dropped off very quickly to depths of over 700 meters (2,300 feet). The researchers speculate that the city of worms might have relied on groundwater or other fluids that were concentrated along this ancient coastline. In this case, the worms might have died out if this fluid flow changed when sea levels started to rise again about 18,000 years ago. These days, Fossil Hill is not a dead “city of worms” but a living “city of clams,” hosting millions of tiny chemosynthetic clams that jostle for space on top of the fossilized worms. In fact, Robert Vrijenhoek, the lead scientist during the ROV survey of Fossil Hill, commented that Fossil Hill had the largest field of chemosynthetic clams he had ever seen during more than 30 years of deep-sea research. All of these observations suggest that Fossil Hill has been a great place for chemosynthetic animals for tens of thousands of years. But what about the worms? The authors speculate that worms like those entombed at Fossil Hill might still be alive elsewhere in the deep basins off Southern California. Finding living populations of these worms would allow scientists to learn if the worms at Fossil Hill really were chemosynthetic. So stay tuned. The deep sea is full of mysteries, including, perhaps, new and undiscovered cities of worms. The Environmental Sample Processor (ESP), a robotic biochemistry laboratory, proved its versatility once again during the summer of 2010, when it detected bacteria at an undersea methane seep off the coast of Southern California. When is a cold seep not a cold seep? MBARI geologist Charles Paull was one of the first scientists to study and name "cold-seep communities." However, after studying several hundred of these communities in Monterey Bay, Paull has concluded that few are located in areas of significant groundwater flow.